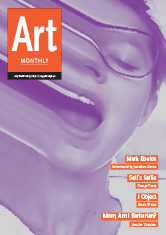 George Vasy and Maria Walsh discuss their feature articles from the November issue 371 of Art Monthly. The serial photographic self-portrait was adopted in the 1980s by feminist artists such as Jo Spence and Alexis Hunter in order to rethink ways of acting. How has a newer generation of webcam artists, such as Petra Cortright and Erica Scourti, responded to their legacy and the challenge of new technology? Artists such as Mark Leckey, Hito Steyerl, Ed Atkins and Andy Holden are keen to dissolve their subjectivity in order to exist in a non-hierarchical network of things. But could this desire ‘to get unalienated’ be seen as an infantile abdication of responsibility and even, paradoxically, a narcissistic impulse? This entry was posted in Art Monthly Monthly and tagged a selfie, Alexis Hunter, Andy Holden, Ed Atkins, feminist art, George Vasey self-portraiture, Hito Steyerl, Jo Spence, Jo Spence and Alexis Hunter, Mark Leckey, narcissistic impulse, new materialism, new object hood, normative Maria Walsh, object hood, object-oriented philosophy, selfie, subjectivity, subjectivity dissolve, the life of objects, the selfie, webcam artist on November 27, 2013 by artmonthly.